If you’d read any of my other Aldnoah.Zero reviews, you’ll know I had high hopes for this show. How did that turn out? Well… er… um… I actually did like it, for the most part, but… well… allow me to grumble a bit. Very mild spoilers below the jump. Also, opinions. Yaaay opinions. Here’s the thing about Urobuchi Gen: He’s the kind of writer who’s more interested in the ideas presented in his story than in the story itself. When he’s fully in charge of a project (Madoka Magica, Fate/Zero) he tends to make it work because he’s a good enough writer with interesting enough ideas that he can hold your attention with themes and competing ideologies, but that’s essentially what all of his stories and – most importantly – his characters are: Mouthpieces for a viewpoint. So instead of crafting fully-developed individuals to drive a story, he tends to craft arguments and then invent characters to embody the different sides within that argument. This is the essential difference between a character-driven story and a plot- or idea-driven one: In the former, the characters control the plot; in the latter, the plot controls the characters. You can still have memorable or likable characters with this model, of course, but you have to be careful with it, too, because if you need to get a character from Plot Point A to Plot Point B in order to portray Theme X, it’s easy to fall into the trap of just having it happen in the simplest way possible, even if that ignores everything we’ve learned about the character previously or, you know, basic human logic. Urobuchi can usually manipulate his stories in such a way that this style of storytelling isn’t noticeably awkward. It’s only when he turns his stories over to other writers (as he did with A/Z) that the cracks begin to show. And this is the problem I had with the final third of A/Z’s first season: The characters cease to be characters and instead become plot devices, doing whatever the story needs them to do in order to get to the next scene. This leads to some truly moronic decisions by the military leadership (“Who gave the unstable attempted murderer a mecha? !” I cried at one point) and a central character who is just about infallible, able to come up with exactly the plan needed to get the story to wherever it’s supposed to go next. At first I thought Inaho was an inscrutable MC because of some personality quirk or formative experience in his past, but the more A/Z I watched, the more I realized that he’s inscrutable because it’s easier for the story that way. The writers can do whatever they want with him because his interior motives are completed obscured (and arguably nonexistent). The rest of the cast is slightly better (except, again, for the military leadership) because we can at least see the cause-and-effect in their actions, but there’s still that sense that everyone moves in accordance to a puppetmaster pulling their strings, rather than as individuals behaving according to their own history and psychology. All of this leads to some pretty painful stretches in credibility as the story progresses (seriously – who gave the unstable attempted murderer a mecha?! ), and increasing detachment from the audience (or at least from this reviewer) regarding the events on-screen. I really liked the entire cast early on, including Inaho, and as such was concerned for their safety and invested in their stories. But the less they acted like people and more like plot devices, the less I cared. I was always interested, true, but I was riveted early on, and I lost that feeling as the series progressed. 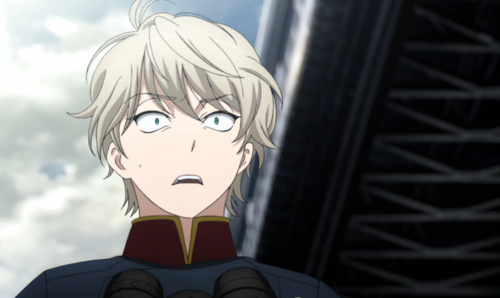 All of this sounds like a pretty damning review, except, well, here’s the thing about Aldnoah.Zero: In spite of some silly plot points in the last few episodes, and in spite of an MC who is pretty much the textbook definition of a Gary Stu, this really is a damn entertaining series. The animation is always solid and often spectacular, the music is flat-out superb, and there’s a kind of trollish ballsiness (yes, trollish ballsiness) to the story itself, a willingness to swerve the plot in unexpected directions and deliberately subvert the audience’s expectations. Despite my gripes about the characters, the central antagonist of the final arc proves to be surprisingly complex, Slaine continues to be a curious and reasonably well-developed character, and although he is something of a cliche I’m still utterly invested in every scene with Lt. Marito, whose ongoing struggle with PTSD is one of the few realistic elements of the series. And, as with most Urobuchi anime, there’s a central debate here that makes the military conflict itself intriguing and worthy of further exploration. A technologically advanced feudal society living in a harsh environment, driven by a combination of jealousy and scorn towards the “inferior” but nevertheless resource-rich Earth – there’s an imperialist sentiment to it, and a sense that there is no easy answer here. The Martians and Earthlings are both in difficult situations, and years of war and hatred make peace seem nigh impossible, particularly after the explosive events of the season finale. Ultimately the first cour of A/Z proved itself to be a popcorn flick but a bit of a soulless one, entertaining without being engaging, and guilty of some truly eye-rolling moments in its later episodes. Even so, high production values, a few characters with flashes of genuine depth, and a strong central conflict mean I’ll be back to see if Season 2 can bring all these fraying threads together and weave a story that is not only worth watching, but genuinely memorable. There’s still enough of a foundation here that A/Z could stabilize its wobbly plot, flesh out its semi-flat characters, and become something worthy of true rather than faint praise. But it ain’t there just yet.